An anniversary brings expectations of a celebration of past achievements, perhaps a taste of things to come. With this recording marking six decades of often path-breaking concert presentations, we get both. Musica Viva has included works by composers who have something interesting to say, both now and for the next half-century. Through excellent, expressive performances, each composer emerges with a characteristic voice. Peter Sculthorpe’s String Quartet No.9 is, by turns, yearning, gently rhythmical, passionate and tragic. Ross Edwards (so like Haydn in his unfeigned musical joy) contributes the sextet Laikan that draws inspiration from around the world. In So It Does, Mark Isaacs synthesises jazz and contemporary idioms. Gordon Kerry pays tribute to the late Phillip Henry, a former Musica Viva artistic director, in Sonata de camera, which takes cues from some of chamber music’s greats. Finally, Carl Vine, Musica Viva’s current AD, offers a quartet (No.4) that refuses easy answers. 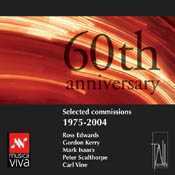 This recording also acknowledges the financial contributions of the commissioners, both Musica Viva and individuals, without which we might otherwise only hear the sounds of silence.